Waterfall is of approximately 15 meters, in an environment of rocks and wild nature.To locate yourself, taking the city of Vic as a point of reference, we will leave towards Olot. Half way, you have to take the exit to Santa María del Corcó and about 8 kilometers, with a road full of curves, we reach the town of Cantonigrós. 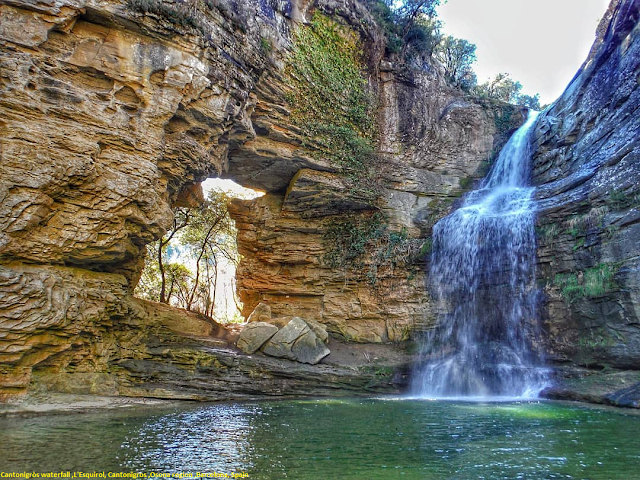 Cantonigròs waterfall and natural pool,(also known as La Foradada waterfall) is located not far from a little town called Cantonigròs (a part of Osona region), situated in central Catalonia (close to C-153 road), Spain. The hike is not difficult and the trek is marked with yellow marks. Cantonigròs waterfall is right next to a big hole in the limestone rock making the whole place look magical. the natural pool is just the place for hot summer days, though it is usually packed with people on those days.